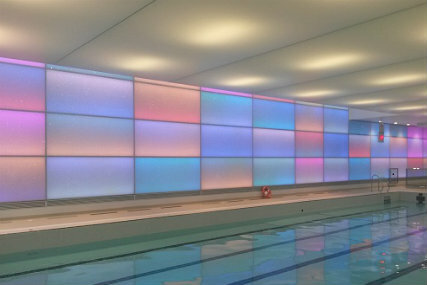 Pancras Square Leisure centre is a new facility that provides two swimming pools (including one 25m pool with moveable floor), fitness suite and spa and sauna facilities in the heart of busy Kings Cross. Spectile Ltd worked with LA architects and main contractors Kier Construction to provide the architectural tiling package for the pool tanks (including finger grip and tread edge tiles), changing areas (floor and walls) and the tiling for the concourse area. Our expertise in the Leisure Industry is second to none and we are able to provide technical support and advice along the way.